I use this chart all the time as an easy way of explaining the process of salvation. I posted it in response to a question on a pastor's forum and was asked where the mind came in for my theory of man being body/soul/spirit. I posted it as a Facebook comment but thought it might be helpful and more readable in this format since you can mouse over Scripture references to easily see them. One difficulty with a firm answer to that is the loose way the KJV translates the relevant terms. Psyche (soul) is translated as "mind" in the KJV three times. On the other hand, the regular Greek word for mind (nous) is used in the LXX to translate ruah (spirit - normally pneuma) and nous is never translated as "soul." The English is just not consistent on the way it handles these questions, so we really do have to look at the original languages. Mind is not a distinct idea in the OT. Leviticus 24:12, for example, is translated mind, but is really "mouth" as a figure of speech for "word" or "command." Numbers 16:28 is "leb," otherwise translated "heart." In Proverbs 29:11, where a fool uttereth all his mind, the word is ruah - spirit. In Ezekiel 23, it is nepesh (soul). There is no Hebrew word that means "mind" the way we use it. That was pretty shocking to me, but a concordance or Bible software will prove it pretty quickly. That has something to do with why Deuteronomy 6:5 does not exactly match Jesus' quotation in Mark and Luke. The Hebrew says heart/soul/strength, the LXX says mind/soul/strength and Jesus adds them together. Does this mean that heart and mind are equivalent since the LXX translators handled it that way? Does it mean they were not equivalent since Jesus adds both words (although not in Matthew)? Does it mean nothing and Jesus is just quoting both common translations from His day to show how complete our love of God should be? I am not sure, but this does show that using the shema to answer these questions is harder than it seems. Anyway, in the NT, mind is certainly a unique idea, although still a pretty rare one. The three "mind" words dianoias, nous and phroneo are translated as "mind" a total of 33 times. The other 50 times that some form of "mind" occurs in the KJV, it is something else, like "being of one mind" or remembering something - in the English "mind" was broken out as a unique word, but it is not useful for our purposes. The same word family is translated as Satan's devices, as understanding, as carefulness, etc. So it is really close to our word mind. As I mentioned earlier, the word "mind" in the LXX often translates ruah (spirit). This fits nicely with passages like Romans 7:23, where the mind and the flesh are set at odds, the same way that the spirit and flesh usually are. In the same way, the passages about having the mind of Christ fit in well with us having the Spirit of Christ. In Romans 1:28, God gave them over to a reprobate mind, which sure feels like the partial withdrawal of His restraining Spirit. Yet, a total equivalency does not make sense of several passages. "Let this mind be in you, which was also in Christ Jesus" doesn't work if it means "Spirit," because as Christians we have the Spirit no matter what. Even stronger, in 1 Corinthians 14:14-15, Paul says that is he prays in an unknown tongue, his spirit prays but his mind does not (translated "understanding" here, but the same word). In Colossians 2:18, there are these people with "fleshly minds," while a "fleshly spirit" is an oxymoron like a heavenly devil or an honest politician. Some passages seem to blur the edges. Ephesians 4:23 says to be renewed in the spirit of your mind, Romans 8:5 talks about either minding the flesh or the Spirit. 2 Corinthians 3 says that the minds of the Jews are veiled until the Spirit of the Lord comes. To me, these uses have to control the passages where things seem interchangeable. Maybe "spirit" is sometimes used broadly to refer to both the soul and the spirit in distinction from the physical (the way that "soul" is sometimes used to refer to the whole person), and sometimes used more technically. But I think it is clear that the mind has some independence of the spirit, is influenced by the spirit and has some control over the spirit. This is where my chart comes in, where the war between the two natures is fought in the soul. Since the formal concept of a "mind" is absent in the Old Testament and is clearly ambiguous in the New, I think that the mind is a description of a characteristic of man (reason) as opposed to a technical subdivision. I think that heart is the same way (although it is a much more common word), referring to the deepest desires of a person (sometimes emotional, but usually not), but not really a technically precise term. Generally, I think that "mind" was we use it, it closely linked with the soul and "heart" is linked with the spirit, but that pressing this distinction too firmly loses sight of the way the Bible uses the language. The New Testament fits this technical distinction better than the old. Here is a fuller argument for distinguishing spirit and soul: I should not have spent another hour on this, and I am probably incoherent at this point, but I have been studying and want to organize my thoughts. "Spirit" is clearly the word used to refer to an impersonal entity. There are familiar spirits, God sends an evil spirit on Abimelech and the spirit of the Lord comes on people. I also take it, that spirit can be used of moods (probably as a figurative derivative of the first usage). So husbands can have a spirit of jealousy, the men of Jericho's spirits left them, The spirit of God is linked with the breath in Job 27:3 (a natural thing, since the word is the same in both testaments) and spirit does seem to be generally linked with "life" in places like Psalm 76:12 and Ecclesiastes 8:8. Animals and men both have spirits (Ecclesiastes 3:21) and the spirits of men return to God when the body goes to the dust (Ecclesiastes 12:7) and children are imbued with the spirit before they are born (Ecclesiastes 11:5 - so obviously it is not simply breath after all, cf Zechariah 12:1). The general dichotomy is obviously between flesh and spirit (Isaiah 31:3). Deuteronomy 2:30 says that God hardened Pharaoh's spirit and made his heart obstinate. At least on first appearances, this makes spirit and heart synonymous. Likewise, your spirit can be merry, broken, humble or proud. Extremely important are the new covenant passages about receiving a new heart and a new spirit (When he repents, David asks for a clean heart and a renewed spirit (Psalm 51:10) ).A man should rule over His spirit according to Proverbs, and in Malachi 2:15-16, God tells the people to listen to the spirit they have (which apparently was instrumental in being married), so they will be faithful to their wives. So, if we are to rule over our spirits and listen to them, obviously there is some part of us distinct from our spirit. Jeremiah 17:9 calls the heart deceitful, wicked and unknowable, which implies there is some part of me distinct from my heart which could hypothetically know my heart. In the NT, spirit does not seem any different. One important verse is probably Romans 8:27, where the one who searches hearts knows the mind of the Spirit. Likewise, 2 Corinthians 1:22 and Galatians 4:6 both say that the spirit is in our hearts. It is our hearts which are circumcised by the Spirit, never our souls (Romans 2:29). Soul is generally equivalent to "person" in the OT. I think this is synecdoche (like "two hundred head of cattle" when you actually mean two hundred cows, but refer to the whole by the key part), but I guess that remains to be proven. Adam was a body, got ruah (breath/spirit) and became a living soul. When Lot ran away, he said that his soul would live if God delivered him (cf 1 Samuel 1:26; 1 Samuel 17:55). When Elijah raises the boy from the dead, his soul is what returns to him. Job 27:8, which Jesus famously quoted, is similar. It is the soul which would not be left in hell (Psalm 16:10, Psalm 49:15). In the sense of the second death, the soul that sinneth shall die in Ezekiel 18. Your soul sins, grieves, worships, loves and hates (Micah 6:7: "The fruit of my body for the sin of my soul"). It is the "soul" that blesses Isaac and it is the soul that sins and is cut off from his people. Fasting is afflicting your soul, and God's soul abhors the wicked (Leviticus 26:30). Soul in Numbers 11:6 does seem an awful lot like the spirit leaving in the men of Jericho, which is interesting. Someone you are very close to is "as your own soul" and God's soul was grieved for the plight of Israel when they repented (Judges 10:16 - whether this should be compared or contrasted with our sin grieving God's Spirit depends on how we answer the broader question). In Isaiah 42:1, God's soul delights in His elect, so He puts his spirit on him. In Isaiah 53:10, Jesus' soul is the offering for sin, that travails and is poured out to God's satisfaction. In Jeremiah 32:41, God returns Israel to the land with His whole heart and His whole soul. 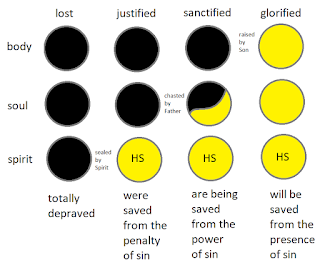 A lot of these seem to indicate that things are not interchangeable: you do not ever see anyone making atonement for spirit or their spirit sinning. Yet, passages like Job 7:11 use soul and spirit in an apparently parallel language. Isaiah 10:18 puts soul and body in contrast (which God will destroy) rather than body and spirit (Jesus, of course, quotes this in Matthew 10:18 - I had never noticed that before). Isaiah 57:15-16 seems to poetically equate heart and soul. In the New Testament, not a whole lot has changed (although soul is kind of an uncommon word); a lot of the uses seem to closely echo the OT usage. Possessing your soul refers to final salvation (Luke 21:19) or to physical death (Luke 12:20; Heb 10:39). Like in the OT passages, Jesus' soul did not stay in hell and his flesh did not see corruption. Interestingly, 1 Corinthians 15:45 tells us that Adam became a living soul and Jesus became a life-giving spirit. This is interesting, but I think that Paul is probably doing some wordplay here on the natural vs spiritual body (for the sake of my own sanity, I am not going to try and bring the idea of a spiritual body into this and I am also not going to try and deal with the translation of logikon in Romans 12:1). Revelation talks about the souls of the righteous (but not their spirits) and the spirits of devils (but not their souls). To get to the famous ones, 1 Thessalonians 5:23 prays for the preservation of body, soul, and spirit. Hebrews 4:12 talks about the Word of God dividing soul and spirit. On that note, there are only 9 verses that include both soul and spirit. Matthew 12:18 is a quotation of Isaiah 42:1, Leviticus 20:6 is irrelevant and 1 Peter 1:22 links your soul to the hold spirit, so it is also not helpful. I have already listed the others, but there are 6: Job 7:11, Isaiah 42:1, Isaiah 57:16, 1 Corinthians 15:45, 1 Thessalonians 5:23 and Hebrews 4:23. The contrasts are important. There is never a holy soul moving across the face of the waters or an unclean soul possessing a man, souls die but spirits never do, We get a new spirit, but never a new soul. Souls sin, but spirits never do. They are not used interchangeably in the Bible and heart/mind do not fit neatly with either. I think a good overview is that the soul is the personality and the spirit is the God-given life. Both seem to exercise something like a mind and a heart, but the mind functions are primarily in the soul and the heart primarily in the spirit. When we are saved, the Spirit comes into our hearts and we have a daily responsibility to renew our minds by that spirit. In some ways, I think 1 Peter 1:13-24 brings it all together. We need to take control of our minds, he says, by remembering our salvation. Verse 22 says that we do this by purifying our souls by the power of our spirits to love the brethren from our pure heart, in the expectation that when our flesh dies, we will be made like Jesus. There is no one place that spells how to fast out, which is certainly one of the reasons we have been reluctant to teach on it. But, the Old Testament didn't give much instruction on how to pray, just examples. People knew what the word meant. Jesus, in the New Testament, deepens the teaching on prayer, but doesn't change the essential definition of talking to God. In the New Testament, Jesus emphasizes the importance of not fasting like the hypocrites, but of fasting for God. But he still assumes people know the basic definition. The basic definition seems to be to not eat for a predetermined period of time. In 2 Samuel 12:16-7, David fasted and didn't eat, but apparently still drank (water?). The Greek word for "fast" is actually "un-eating," In Esther 4:16, drinking is also abstained from, but that seems to me to go beyond the strictest definition of fasting. That period of time should be set prayerfully sand carefully, because it is better not to make a commitment at all than to break it (Ecclesiastes 5:4-5). Early Christians, following the Jewish custom, fasted two days a week, Wednesdays and Fridays (commemorating the betrayal and crucifixion of Jesus). Fasting for a single day, three days, seven days and forty days (Moses, Elijah and Jesus). "The Fast" became a synonym for the Day of Atonement, the only fast prescribed in the law. In fact, it is not even explicitly called a fast in the Old Testament (but it is by Paul in Acts) - fasting is included in the broad "afflict your souls." I think that makes it clear that fasting is a kind of mourning (Joel 2:14) of our separation from God, and was therefore not appropriate when Jesus was on earth (Matthew 9:15). It is a pretty natural connection, since when we are grieving, we lose our appetite. Fasting is not always necessary, but is a way of drawing ourselves closer to God. It is kind of broad, because it can represent repentance, a desire for revival or just seeking for God's direction or action. But the idea of God's distance is the same in all of them. Since fasting is also called worship (Luke 2:37), it is a beautiful picture of how /wanting/ to /want/ God can itself be a form of praise. The New Testament pattern is drawing closer to him for clarity on major decisions, and fasting does seem to always be paired with prayer (Acts 13:3). I think that Jesus' quotation when tempted of Satan shows that fasting is voluntarily entering into the situation described in Deuteronomy 8:3. Being without food humbles us and teaches us to eat the hidden manna, the bread the disciples knew not of - the strength that comes from the Word of God (and especially the Incarnate Word). This is probably the passage I would use as my central text in a sermon on fasting, even though it doesn't mention it specifically. God put the people in a forced fast, but I think the idea is clearly the same. I know you don't need me to mention the most obvious things, but of course the prophets and Jesus condemn fasting when it is done in a life of sin or for show. I won't mention those passages, since they are the best known. So my basic model for teaching our church to fast is "Lord, we come to you, humbly recognizing that we are not as close to you as we can be, and as we desire to be. We grow proud and self sufficient in the illusion that we feed and clothe ourselves, when we are as dependent on you for those things as the birds and the flowers are. We want to learn to be hungrier for you than we are for bread, which can only temporarily satisfy. We want to learn to draw our hunger from you, instead of from the dissolving world around us. We want to learn that we cannot live by bread alone, but must hang on your Word. So we commit to, with your help, abstain from all food and drink only water for three days. During that time, every pang of hunger will not be an excuse to think of food, but a reminder to be hungry for you and to pray. As we recognize when eating is a habit, we will try to break the way we mindlessly structure our lives around it, and learn to make you the center instead. As we take time we would have spent eating food feasting on your Word and praying, we are confident that you will draw us to yourself. Keep our eyes off the countdown to our next meal, and firmly on your face. We ask for freedom from hypocrisy and pretension, so those who see us will not see someone who is moody and hungry, but joyful and full of You." When praying specifically for guidance or intervention, that would be tweaked a little bit. But I think the basic idea is the same. People with medical conditions can "fast" with juice or whatever, as long as something is picked which does not undermine the entire point of mourning and self denial. Fasting breaks the idolatry of the material world (or at least exposes it), practices self-denial in a culture which has never heard of it and is an unforgettable reminder of our real priorities. What comes to mind when you hear the word "bless"? Maybe a pious "have a blessed day," or "How are you?" "I'm blessed!" We have a sense in those cases that it means something like "good." When someone sneezes, we might say "God bless you!," hoping, through various traditions, that the sneeze does not fortell greater harm. So great is the power of "bless," that it can turn an insult into a kindness. "She couldn't cook a casserole if Betty Crocker were holding both of her hands - bless her heart." Well, maybe not. In the ancient Greek world, the word began with the "blessed gods," who did not have to work, but could rest on Mount Olympus. The wealthy and the dead were called blessed, because they too were considered free of pain and work. The Intervarsity Press Dictionary of Jesus and the Gospels summarizes it well: "The Greek blessings reveal what was valued and what was thought to make for earthly happiness: a lovely bride, excellent children, moral rectitude, wisdom, wealth, honor and fame." So we see that to be blessed was to stand in favor and privilege; happy, while an imperfect translation, does catch a glimpse of it. It is surprising then, to find the same Greek word on the lips of Jesus in Matthew 5:2 and following. "Blessed are the poor in spirit.... Blessed are they that mourn... Blessed are the meek (or the gentle)... Blessed are they which do hunger and thirst after righteousness... Blessed are the merciful... Blessed are the pure in heart... Blessed are the peacemakers...Blessed are they which are persecuted for righteousness' sake.... Blessed are ye, when all men shall revile (or mock) you, and persecute you, and shall say all manner of evil against you falsely for My sake." That does not sound like the blessed state of the gods, the obscenely wealthy or the peaceful dead! It does not sound like the state of favor and privilege which produces happiness, and it is certainly a long way from a lovely bride, wealth and fame. Poverty, gentleness, mourning and persecution are not the traits that we associate with celebrity tycoons. What Jesus is proposing here is nothing short of revolutionary. Throughout history, power has changed hands many times without changing form. Every few years, we elect new politicians who are very much like the old ones. At work, your boss may change, but the basic way of doing things never does. In the so-called American Revolution, power moved from the King to the President and the Parliament to the Congress. In the so-called French Revolution, power moved from the clergy and the nobility to the merchants and the military. In our daily lives, there is no real revolution, only renovation. But at the very beginning of His preaching ministry, Jesus offers us something different. There is an invasion going on. The King of Heaven has come down, and His Kingdom will not be a redecorated version of the same old world. Human kings might put a fresh coat of paint on the termite ridden palace and call it good, but Jesus the Christ would settle for nothing less than a complete overthrow and a clean slate. Put differently, this revolution would not change the winners, but the meaning of winning. So dramatic is the change that in Matthew 19:18, Jesus talked about sitting on His throne of glory in the regeneration. The world itself will, translating literally, be born again. It was not for nothing that the pagans in Thessalonica said: "These that have turned the world upside down are come hither also." (Acts 17:6). In the coming days, we will look at each of the beatitudes in more detail. Today, we can see the shape of them. The most dramatic all include a future reveral. Those that mourn are blessed: for they shall be comforted. Those who are gentle are blessed, for they shall inherit the earth. The persecuted are blessed because the Kingdom of Heaven is theirs. The reviled and persecuted are blessed, because their reward is great in Heaven. Our present circumstances must be compared to our future blessings. When we understand the goal of something, we can tolerate it. someone exercises today to be healthier tomorrow. If the pain and heartache of this life never ended, it might be unbearable. But when Jesus promises that the mourners will be comforted and the inheritance of the poor will be the earth itself, He fixes a light of hope at the end of the tunnel. Our present circumstances are put into perspective by the glorious unfolding of history. Our future blessings make us blessed now. This is probably the really shocking thing. The average Pharisee would agree that many wrongs would eventually be righted by God. But Jesus is saying something much deeper. He doesn't say "Blessed will be the poor" - but "Blessed are the poor." Because the King is here, the Kingdom has arrived. The blessings are not full grown yet, but like a tree root smashing a sidewalk from below or, even better, yeast working its way through a lump of dough, it is subverting the very world it exists in. Although Jesus will not wipe every tear from our eyes now, we can be comforted by the promise of comfort. Because Jesus rose from the dead, His promises are so sure and unshakable that they might as well be already fulfilled. Sometimes people will say that they want to become a Christian in case they die. But the Beatitudes show us that we can enjoy those eternal blessings right now. We may not be freed from the presence of sin now, but we are blessed to know that we will be. We may not see God now, but the certainty that we will makes us blessed. We may not sit on clouds like the Greek myths, but we, recognizing our own poverty of spirit, are blessed because we can rest in the finished work of Jesus. Of course, this reversal of values is seen even in the method of the Kingdom's conquest. Jesus does not establish His foothold by killing, but by being killed. Not by dying in a military strategy for His friends, but for His enemies. On the cross, Jesus proved that He took His own teaching seriously. By losing His life, He found it again, for Himself and all those who would turn from their sin and trust in Him. Howard Hendricks said that most people never think, they just rearrange their prejudices. As we prepare in the coming days to work our way through the Beatitudes and see the situations that God calls good, it is my prayer that you will brace your heart for more than a rearranging of old ideas, but that you will let the radical invasion of the Dominion of Heaven turn your priorities upside down.